The EMD SDP40F is technically not part of the builder's F models but it is referred to as such here since it is a cab design. 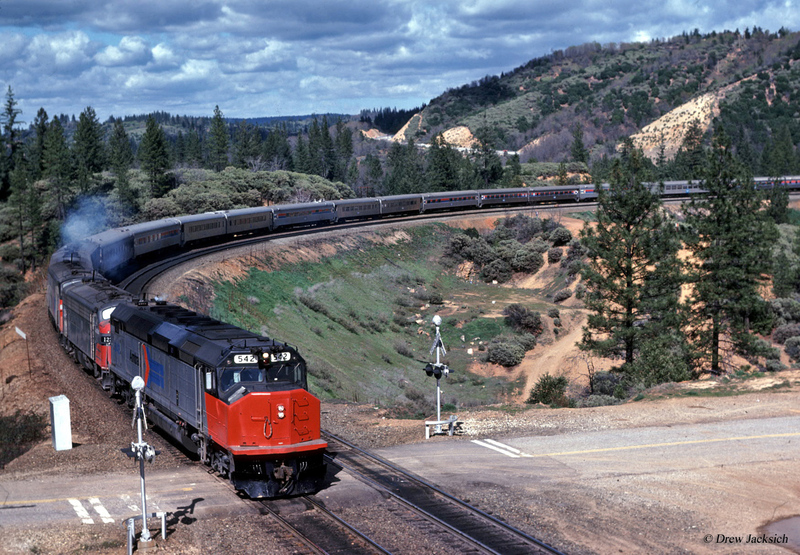 The design was essentially an SD40-2 wrapped in a semi-streamlined body for use in passenger service. The model was purchased only by Amtrak, and was manufactured partly out of desperation as the carrier had received second-hand, rundown equipment from many railroads and need new, reliable equipment. While reliable the SDP40F had derailment issues at high speeds, limiting their maximum operating speed and Amtrak looked to replace them, which resulted in the development of the F40PH. All were off of Amtrak's roster by the early 1980s although the Atchison, Topeka & Santa Fe Railway purchased some of the fleet for use in freight service. Today, a few of these locomotives remain although just one is known to actually be preserved, former Amtrak #644 (painted as Burlington Northern Santa Fe #6976) located at the Northwest Rail Museum in Portland, Oregon. 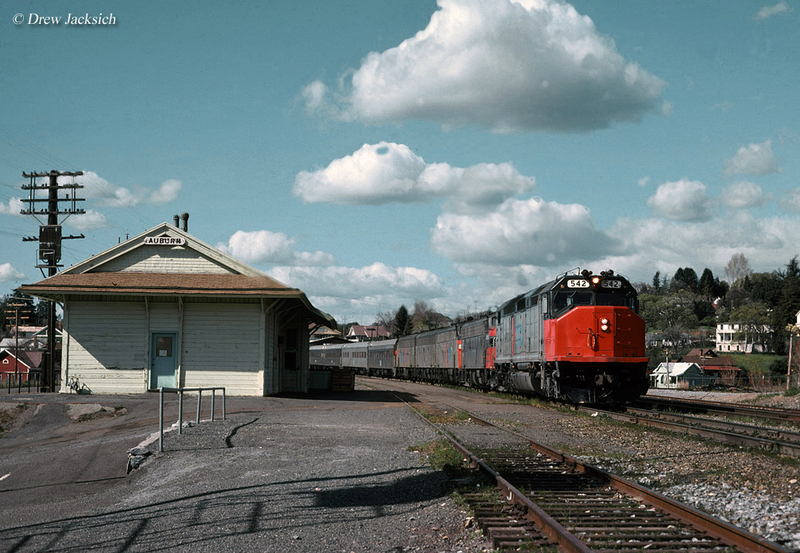 The EMD SDP40F began production in the early summer of 1973 as Amtrak's first new motive power it ever received. Being designed after the phenomenally successful SD40-2, inwardly the SDP40F was essentially identical featuring General Motors' 16-cylinder model 645E3 prime mover which could produce 3,000 horsepower. Featuring a C-C truck setup and GM's model D77 traction motors the model could produce just over 38,000 pounds of continuous tractive effort and 65,000 pounds continuous (in comparison, the SD40-2 featured 92,000 pounds of starting effort and 82,100 pounds continuous). The SDP40F was rated for a top speed of 95 mph although it never achieved such speeds in use with Amtrak. 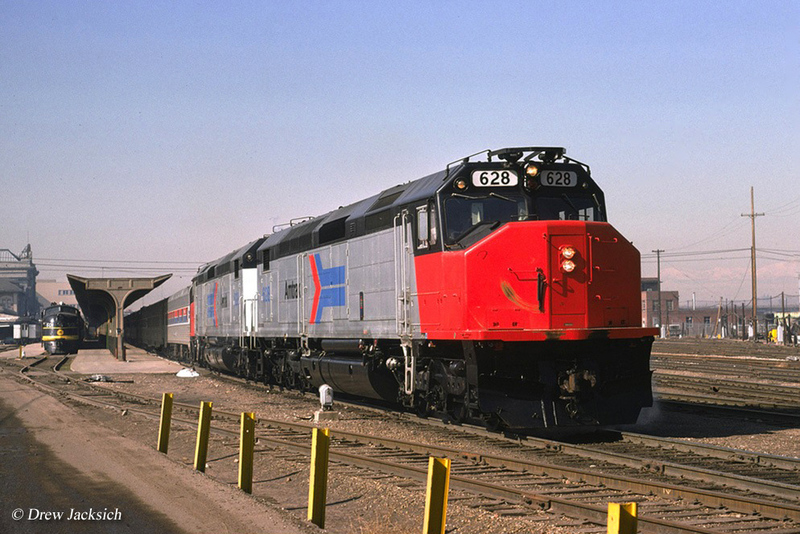 The EMD SDP40F's carbody closely resembled that of the F45 and FP45, the "cowl" design, with a tapered nose, and semi-streamlining to the rear of the cab (similar to today's "Safety Cabs"). This design was never particularly stylish with little elegance. Unlike the first generation EMD cab designs, the cowl carbody used no beveling with hard lines and corners giving it a very boxy appearance. While no railroad or official is ever known to have commented on the styling of the cowl design the fact that many more classic covered wagons remain in use today, such as those powering Norfolk Southern's and Union Pacific's business trains, as well as the units in use by Canadian Pacific on the Royal Canadian Pacific, speaks to which carbody has remained the most popular throughout the decades. For reasons never determined the SDP40F suffered from many derailments, curtailing its maximum speed which resulted in Amtrak looking for an alternative locomotive design as its primary motive power. However, it was thought that the heavy rear end of the locomotive due to the weight of the boiler and water caused an unbalance that resulted in the derailments. Further hindering the model was that it used a steam generator to heat and power passenger cars. However, new, electrically heated, cooled, and powered passenger cars were entering the market during the period resulting in the steam generator becoming obsolete. Overall, however, the SDP40F was not meant as a long term solution to Amtrak's motive power situation (although, perhaps, its use was much more brief than intended). 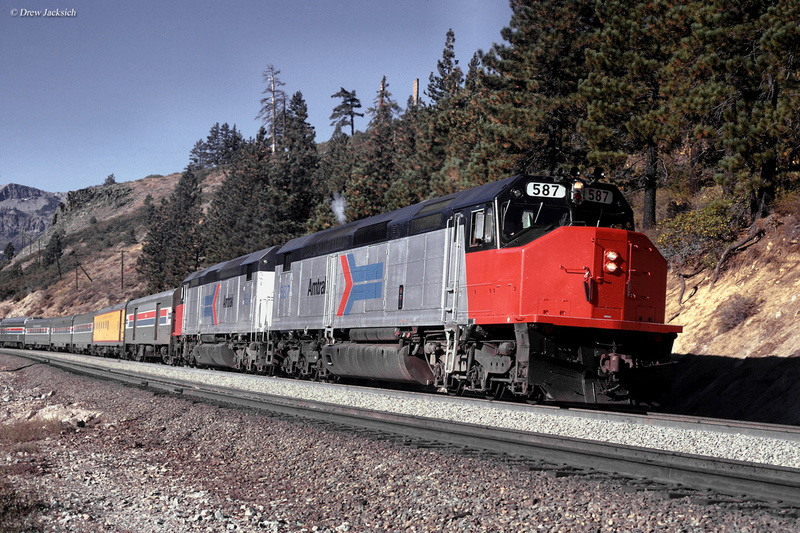 As such, with the development of the F40PH in 1976, which featured head-end-power (or HEP) to power passenger cars EMD, and the fact that the model was designed after the GP40 using only a B-B truck setup (resulting in a more stable platform by use of a shorter frame), allowed Amtrak to sell its fleet of 150 SDP40Fs as the new models arrived. Because of this the design had a very short operating life on Amtrak (all were gone by 1985) but a few were sold to the Atchison, Topeka & Santa Fe, which overhauled them for use in freight service. For more reading about Electro-Motive products Mike Schafer’s Vintage Diesel Locomotives highlights virtually all of the classic builders and models from Alco PAs to early EMD Geeps. If you’re interested in classic EMDs, or diesels in general, this book gives an excellent general history of both. You might want to also consider the book EMD Locomotives from author Brian Solomon. Solomon's book highlights the history of EMD from its earliest beginnings in the 1920s, to its phenomenal successes in the mid-20th century, and finally its decline into second spot behind General Electric in the late 20th century and eventual sale by General Motors in 2005. The book features 176 pages of EMD history and is filled with excellent photography and illustrations. Finally, Mr. Solomon's Electro-Motive E-Units and F-Units: The Illustrated History of North America's Favorite Locomotives provides an in-depth history of the the builder's classic covered wagons.